Create your own bundle of essentials to fit your daily keto routine, and get 15% off 3 or more products. Corina Nielsen is a professional recipe developer, photographer, and food stylist. It’s like having dessert for breakfast. 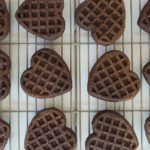 These light and fluffy waffles are loaded with rich, dark chocolate flavor and have a wonderfully fluffy texture, so nobody will ever guess they were low in carbs. Unlike the stacks you’d find at your favorite waffle house, these have the perfect balance of ‘sweet’ and you can rest assured they will not kick you out of ketosis. As an added bonus, they are absolutely perfect for meal prep and batch cooking. Save precious time during a busy week and have a healthy breakfast ready in a matter of minutes. Simply make a batch (or three) at the beginning of the week and store them in the fridge or freezer. When you are ready to put breakfast together, just pop the waffles in the toaster to reheat. They are so easy to make, you will wonder how you ever lived without them. Regular protein waffles usually taste and feel like cardboard, but not this stack. The blend of almond flour with the Perfect Keto Chocolate Collagen and touch of coconut flour provide the perfect consistency. You will have all of the benefits that collagen has to offer, plus the highly impressive nutritional boost of almonds. Almonds are rich in this type of healthy fat which has been known to improve and maintain cholesterol levels. They can help reduce the risk of coronary heart disease, increase levels of antioxidants, and reduce blood pressure. These nuts have a perfect balance of protein, carbs, and fat that will help keep your energy levels sustained and well balanced. Almonds also contain micronutrients like vitamin B2 and manganese which play a role in energy production in your body and help boost cellular function. Because almonds have this unique balance of macronutrients, they are a great food to help regulate blood sugar levels. Uncontrolled insulin levels can lead to things such as diabetes and metabolic syndrome. Almonds have a GI (glycemic index) impact of 0 so you can rest assured your blood sugar will not spike. The next time you have a recipe that calls for flour or need an option to bread something, almonds and almond flour will come to the rescue. They are the perfect base for keto baked goods and breakfast foods like these low carb waffles. Enjoy a big stack to feel energized, full, and ready to tackle your day. Add all ingredients to a large bowl and mix well until smooth and everything is well incorporated. Let batter rest for 5 minutes while you preheat your waffle iron. Stir batter after a few minutes. Add 1 tablespoon of milk at a time if batter appears too thick. Lightly coat waffle iron with butter or non-stick spray. Cook waffles according to waffle iron manufacturer’s instructions.